Hello ... Hello ... my old friends ... It's great to see you once again! The Electric Light Orchestra [ELO] is now Jeff Lynne's ELO and a new generation of fans are emerging in the wake of their spectacular live return at Hyde Park back in September 2014 to join their already substantial loyal and hardy band of followers in welcoming the latest studio offering from Brummie legend and ELO maestro Jeff Lynne. If 2001's "Zoom" was also termed by some as "Armchair Theatre, Part II", then "Alone In The Universe" [Columbia #888751451124] is nowhere near a "Zoom" follow-up. Fourteen years have elapsed and in that ensuing "Time", Jeff Lynne has become a real one man music machine who has managed to produce a long player that combines the different phases of that ELO 'sound' whilst retaining his own solo imprint and imbuing it with the afterglow of his heroes The Beatles and Roy Orbison. Jeff's love of The Fab Four is easy to identify with lead single and opener "When I Was A Boy" a now familiar autobiographical - if not beautiful - song with many Lennonesque facets with "Ain't It A Drag" a good 'ol sixties screamer with a hint of his Traveling Wilburys adventure. "I'm Leaving You" is made for The Big O and is the perfect partner to Lynne's other Orbison opus "Endless Lies". My personal fave at the time of writing is "Love And Rain" - a return to the early ELO roots of "Showdown" which is nicely counterbalanced by the smashing disco foot stomper "One Step At A Time" - an excellent update from those heady "Discovery" days which is sure to be a live hit during the upcoming 2016 UK and Europe tour. "The Sun Will Shine On You" is sheer sonic class - a delight to the ears with the pensive "All My Life" and embittered "Dirty To The Bone" - the antithesis to "Evil Woman" - both truly enjoyable if not representative of the solo element of Jeff's career within the album. The reggae tinged rocker "When The Night Comes" could easily nestle in "Balance Of Power" with the haunting title track "Alone In The Universe" almost an echo of "Without Someone" but feeling like a rediscovered echo from the "Secret Messages" sessions. 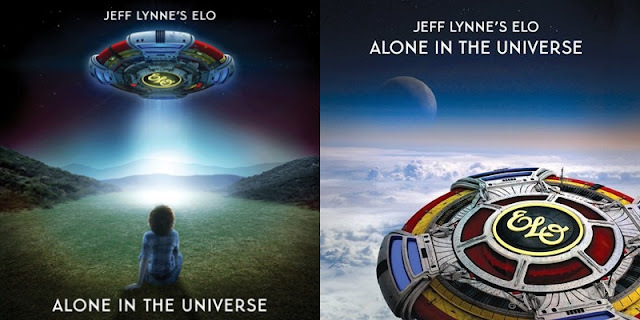 ELO Beatles Forever [ELOBF] recommends "Alone In The Universe" by Jeff Lynne's ELO to those enlightened folks who enjoy the music of ELO, Roy Wood, The Move, The Idle Race, 'Brum Beat', The Beatles and related artistes. Have you heard Fault Line or Blue yet? Very nice review KJS. I am looking forward to receiving my album next week. Could this be the last ELO record? JL does not have 14 more years to waste in between albums anymore. Heaven Only Knows if we will ever see a new one or maybe It Really Doesn't Matter. One can just keep Wishing. Fault Line is a little rockabilly and Blue is like he wrote an original for Long Wave. Could someone point me towards "On My Mind"
I've listened to the album once and early impressions are ok. I don't think there are any Greatest Hits on here... there's not an Evil Woman, Showdown, Mr. Blue Sky or Livin' Thing and that's disappointing. Each song is perfectly crafted and pleasant with WIWAB, Love & Rain and Alone In The Universe my own personal favourites so far. My own view is that the album is more of a cross between Armchair Theatre and Zoom with elements of Secret Messages thrown in. Love & Rain is very Showdown-era but just doesn't get going... none of the songs do unfortunately. As I said, a perfectly pleasant album but nothing spectacular... although after I've listened to it a few more times, maybe I'll have a different view. Fingers crossed! My honest review being a big ELO fan and running the Keith James Sinclair show every friday's at 10 am est on Hamilton Radio channel 1 . Expectations were very high but being honest many songs here need many listens to get the ELO in me to generate. Yes some tunes I found very nice but overall expecting the real ELO sound from The New world Record days and Out Of The Blue and many albums after that. I Love Jeff and ELO and always will but this is not what I think is the ELO sound for 2015 should be? The drum beats are not Bev's as you can hear,still in all there is still the Jeff Lynne sound on every song,with base underlines of other older songs. However I will be playing them all daily and let the listeners choose the best tracks to keep playing. These are just my opinions and of nobody else. I totally agree. The last album to feature the classic ELO sound was Out of the Blue. After that, Jeff relied less on real strings and more on synthesizers (cross between space synth rock and 50's retro). I like both sounds especially the Time LP from the later period, but nothing compares to "On The 3rd Day", "Eldorado", "Face The Music", A New World Record, and Out of The Blue, Those are the 5 essential ELO albums. A lot of people are comparing this album to that of Out of the Blue,new world record and so on,but that is 30 odd years ago.People should look at the other albums he has done since for other people like Tom Petty,Regina Spektor and Juliana Ray as well long wave and other odd releases that have happened to see which direction his music was taking. Have listened to album for last 24 hours and apart from the 3 singles that we have heard,the title track could appear on any of original ELO albums.Love and Rain and Ain't it a drag are classics and All my Life is haunting musically. I think in years to come ELO fans will look very favourably over this Album and will stand the test of time. I really like Alone in the Universe, but as far as ELO albums go I'd say it is closest to "Balance of Power" which was a really good album. However, to compare it to Out of the Blue or A New World Record is ridiculous. Those 2 albums were masterpieces. UCR Artist of the Year Poll: Vote for Jeff!